These oven baked stuffed pork chops are SO good, inspired my a meal I had at a local Italian restaurant stuffed with prosciutto, mozzarella and baby spinach then topped with garlic and breadcrumbs. I ordered a similar dish a few nights ago and loved it so much I made them the next day. The pork chops were on the bone, which would also work but what I loved was how the pork chops were sprinkled with breadcrumbs on top rather than completely breaded, which gave them some texture – exactly what I was craving. My lighter version eliminates the butter I am sure they drizzled on top, and I used much less crumbs but I loved the results. 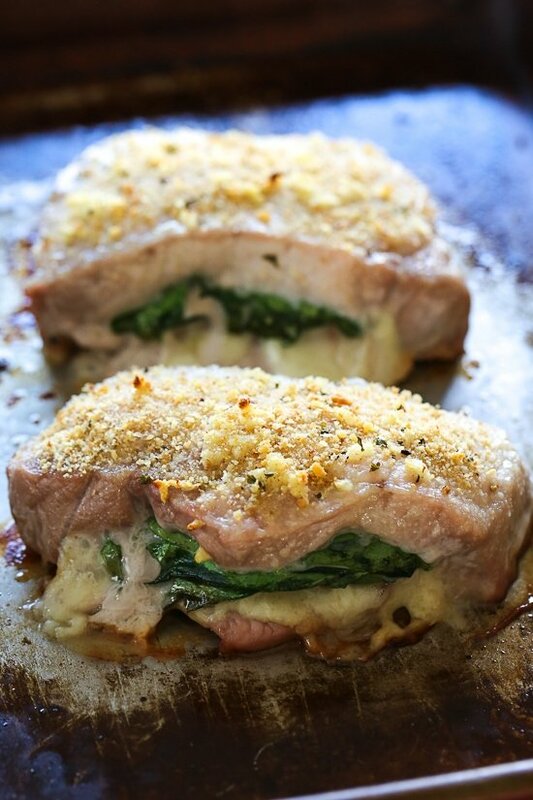 These stuffed pork chops are SO good, inspired my a meal I had at a local Italian restaurant stuffed with prosciutto, mozzarella and baby spinach then topped with garlic and breadcrumbs. Cut a deep pocket all the way through one side of the pork chops leaving the sides in tact. Stuff each with chop with 1/2 slice prosciutto, 1/2 slice cheese and 3 leaves spinach. Season both sides of the chops with salt and pepper then place on a baking sheet. Top with crushed garlic and breadcrumbs and bake 20 minutes. I omitted the prosciutto and did mozzarella instead of swiss. The kids loved it and didn’t complain about the spinach (which I added extra of). I lowered the temp to 420 convection and cooked for 15 minutes. Perfect! 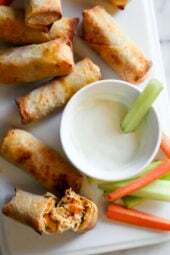 Has anyone made these in the air fryer? This was so good! I skipped the prosciutto (I need to be on a low sodium diet), and I added asparagus. So so good! This was surprisingly easy to make, but looks and tastes very impressive. These are so good! Bought the chops from the butcher and they even cut them for me! Looking forward to making this again. why do you specify sargento cheese. Wouldn’t it be better to get locally produce comparable quality cheese? It’s what I used to calculate the nutritional info, use any brand you like. I made this for myself and my husband and I thought his jaw was going to hit the floor when I told him it was a meal I could eat on WW. This has become one of our favorite dinners! It’s so delicious and so easy for a weekday meal. I’ve since made your ratatouille with Havarti, and look forward to making you Korean Beef and Rice recipe tonight! Thank you for all of the wonderful recipes that are both satisfying and healthy! This was so delicious and flavorful! I made this tonight. Delicious!!! Used Bell Peppers instead of spinach and covered the top with prosciutto, as well as half a slice inserted. I also used crispy fried onions as topping. Overall, completely impressed and amazing meal, thank you for sharing.. Turned out very well and will enjoy making again. Can vary the fillings with what I have on hand too. I used some artichoke and roasted red pepper and some laughing cow cheese wedge, and spinach, Could use any of the fillings that you have suggested for the chicken/turkey and pork tenderloins. I baked 15 minutes and took out and let it rest and it was well cooked but not tough. That is something I always have trouble with when making pork chops, have to be careful not to over cook them. We loved this and would be a nice dish for company too. Pork chops are always bigger when I get them then 5 ounces, hard to find any smaller these days. This was very good, there wasn’t a huge amount of stuffing, but the taste was fantastic. The breadcrumbs didn’t brown up so I added a little cheese on top and placed it under the broiler for a couple. Great with a salad. 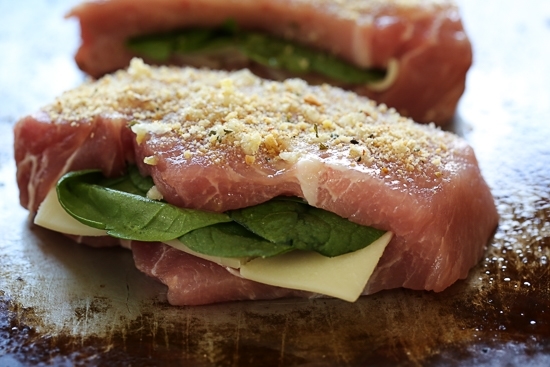 I don’t cook pork chops but this looked really good so I floured and peppered some thin chicken breast cutlets, cooked them in a skillet and layered the spinach, Serrano ham and mozzarella cheese on top. Then I covered the pan for a few minutes to melt the cheese. My family said it’s a keeper. Done with thick chicken breasts, cooked 10 minutes longer, and was AMAZING!! Whole family loved it. Thanks, Gina! Another Skinnytaste winner! This was easy, delicious and elegant. I left the spinach out in the chops for the kids.. and the whole family loved the meal. These Pork Chops made our Wednesday night dinner very special! Is the amount of garlic and breadcrumbs listed for all 4 pork Cops or for each? Doesn’t seem enough, also, when does the olive oil spray come into play? Spray on top? I made this for the second time and served it with couscous and steamed broccoli. My husband said it was “a top notch dinner!”. Could you do this in the Instant pot? Really very tasty and simpke to make. Result moist pork and readily scoffed by the family. Served with linguine and tomato & mascarpone sauce! I made this last week and it was delicious!! We had it tonight and it was delicious! Thank you for the yummy recipe! Look great, making them tonight with a salad. I brought the prosciutto and cheese already wrap. I made this tonight and it turned out wonderfully – so flavorful & juicy! I did turn the heat down to 400* and tacked on another 7 minutes in the oven as my chops were REALLY thick. I’d highly recommend this recipe & will make it again. Is it 1 clove of crushed garlic for each chop or 1 clove for all 4? I’ve made these last night and they were fantastic. So easy and my picky son even loved them. Definitely a keeper. Hi Gina, this looks wonderful, but I was wondering if this would work on the grill? I have not tried but it might! I made these a few weeks back and they are awesome. Having company next week and I’ll be serving these. Can’t go wrong ! agree that the temp is too high! would make again for sure, but would adjust the temp to lower and bake a little longer. super easy recipe, little to no prep; a winner! This was fantastic!! I made this with your mashed potatoes recipe and it was great. My boyfriend wants me to make this regularly now. I did add a bit more breadcrumbs because the amount listed in the recipe didn’t cover the chop as much as i wanted. I have never made such delicious pork chops! This was delicious! I made it for my boyfriend last night and was a little nervous about overcooking due to some of the other comments; however, my chops were thicker and needed an additional five minutes to cook through. 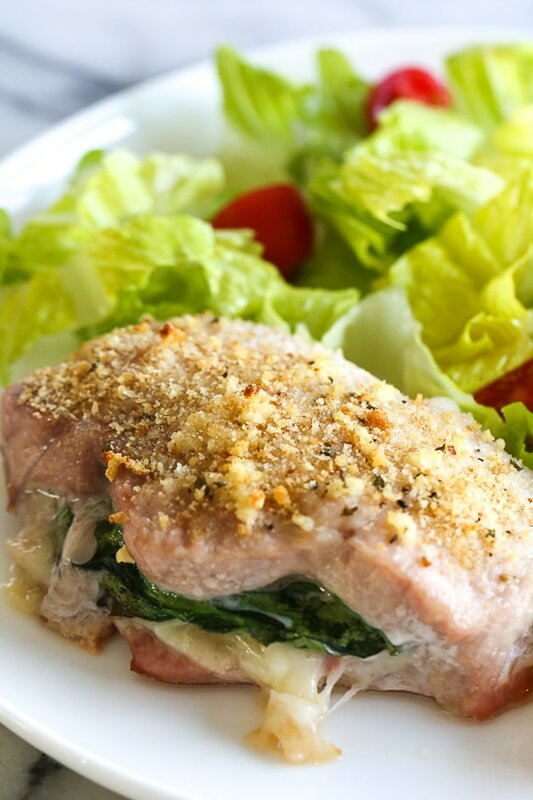 The pork was moist and flavorful – thank you for such a great recipe! Made these tonight – delicious! My chops were huge so I cooked 5 minutes longer and they are perfectly moist and delicious. So easy to prepare after getting home late from work. Served with roasted broccoli. Love your recipes! We eat your avocado egg salad with smoked salmon at LEAST once a week. When the saturated fat is left blank does that mean it’s 0? When I calculate with zero it comes out to 4 smart points. Just want to be accurate in my tracking! I love ❤ your recipes. I’m down 11 pounds since July 2016. Thank you for all your hard work and sharing with us. I have made many recipes from here, but just not a fan of this one. I made it in the oven first time and the IP with the balsamic glaze recipe from the slow cooker pork loin recipe the next time. Both results were really dry and bland. I will stick to brining and grilling my pork chops, stuffed or unstuffed. I also didnt think this particular stuffing added anything special. Big fan of the cookbooks and website though! Every recipe I have tried has been wonderful. Nothing bland, great flavor… It proves that when you eat right you don’t have to skip on flavor. This was delicious! The only thing I did different was that I used seasoned panko instead of breadcrumbs. I like the crunch of panko. Thank you for the lighter version of a recipe that is soooo heavy. Been enjoying so many of your recipes! Turkey pot pie soup is another hit!! This one disappointed me… The overall flavor is good but the cooking temp was way off. Baking these at 425° is too high. The chops shrank considerably smaller than any other time I have cooked them. I knew I should have lowered the temp but you had never let me down before so I followed the recipe to a T. I’m not a novice chef bty any means so this is used error, just feedback. 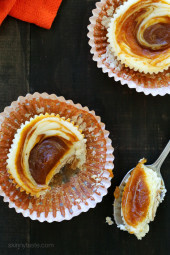 I made these last night exactly by the recipe and my family loved them, even the picky eater. Delicious! 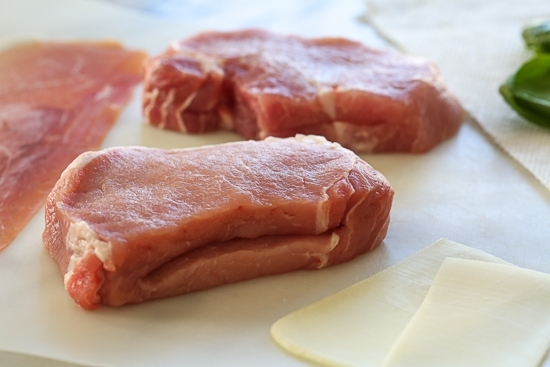 I have a ton of pork chops I bought from Costco this weekend… I plan on making these! I don’t have prosciutto on hand, but I do have a ton of salami, I’ll try it with that. Thanks, Gina!! Where do we add the crushed garlic clove? Excellent meal! My guys loved….so did I! Made this yesterday for dinner, and it was so good and so easy! Even my boyfriend who “doesn’t like pork chops” ate them up! Made these yesterday, family loved them, my chops were a bit thicker so I needed extra cooking time. So easy we will be making these again. Glad you and your family enjoyed them! We made this last week and it was amazing! We made it per the recipe, no changes. This is in the oven now and it smells so good!! Cannot wait to try it. Made this for dinner as written, except I mixed a little garlic powder with the bread crumbs instead of fresh. It was wonderful and everyone including teens and children loved it. Suitable for company! I just made this last night and it was very good. My 5 year old also ate it and really liked it (he is picky). I didn’t have prosciutto so I just used the mozzarella cheese and a mixed spinach/kale mix I had on hard. Everything was very flavorful. The only issue I had was in the pocket I created on the meat to fill in the stuffing. Is there an easy way you recommend doing this I felt like I butchered the meat a little in the process? It all still came out fine though. I lay my hand on top of it and with a sharp pairing knife make the cut. When I put the nutritional information into the WW calculator, I get 4 smart points. Am I doing something wrong? The only reason I checked it out is because with the low carbs and high protein, I thought it may be less than 7. Thoughts? Made these last night – they were great but a bit dry 🙁 I may have to add more cheese next time and cook for less time? If they were thinner chops, I would cook less time. This was great! I plan on doing this with chicken in the future! Have you tried making ahead and freezing them? My BF and I loved these. So easy to put together and can make ahead of time. I am following ww smart points and followed the recipe exactly. Served with steamed green beans and was completely full! Great! Glad you enjoyed them! Made this last night and it was amazing. Instead of breadcrumbs I used whole wheat panko and seasoned that with garlic powder and paprika. 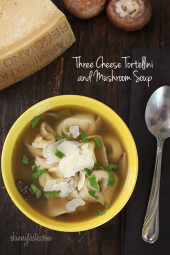 making these for dinner tonight- can’t wait to try! Made these last night. Pork chops don’t take much time to put together. But I would cut the cooking time down as mine were dry. Next time I will lower the temp to 400 and cut the baking time to 15 minutes. I might even turn them half way so each side can get crisp. They tasted really good, just dry. Agreed! Delicious — but slightly overcooked. I would cook them for slightly less next time too. What would the cook time be if you used chicken breast ? Did leave out the spinach as I’m not a fan of it cooked and had brought some mushrooms with the intention of sauteeing and adding to the filling but forgot – so had them on the side! The printer friendly button seems to have disappeared. : ( When I go to print option it comes out to 18 pages. Just made this…absolutely amazing! I love that all of your recipes are healthy yet do not lack in flavor! It makes eating healthy much easier! Looks amazing! On the menu for this week! Yum! Do you think this could be frozen prior to baking? If so, would you try thawing then baking, or baking longer from the frozen state? Hoping to use this for Christmas dinner. Thanks, Gina! Your recipes are always loved by my family! Made this tonight! So delicious and easy. I love that I could put them together ahead of time and just pop them in the oven when Hubby got home. Love dishes like this! I would imagine on the bone would take longer to cook? Just bought my sis your cookbook for her birthday! Your recipes are so inspiring! OMG definitely making these soon! thanks for all the great recipes! Oh, so easy and yummy looking, I am making this week! Thanks. Hubby bought me your cookbooks for Christmas, can’t wait! This looks really good. I think I’ll make this using fresh basil leaves instead of the spinach and add in some diced sun dried tomatoes. Either way, this recipe looks like a keeper ! I see the olive oil spray on the ingredients list. Are you just spraying the pan, or are you also spraying the meat with the crumbs on top to get that crispiness? I also sprayed the top to crisp the crumbs. Looks delicious! What would you accompany the pork chops? Really almost anything you like! A big salad would work great, or http://skinnytaste.wpengine.com/skinny-scalloped-potato-gratin/, http://skinnytaste.wpengine.com/skinny-buttermilk-mashed-potatoes-with/, or http://skinnytaste.wpengine.com/creamed-spinach-lightened-up/. But really just about any side would work! Could you do make this with Chicken breasts? Would this work well with chicken breast? Love your recipes so much!